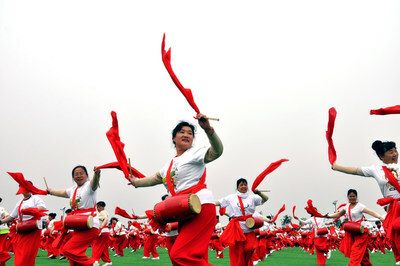 XI'AN, China, March 13, 2019 /PRNewswire/ -- The city of Xi'an in China's Shaanxi province has held its 2nd Xi'an Farmers Festival ("the Festival") to further promote the region's agricultural innovation and development, celebrating its agricultural harvest and the fifteenth consecutive year of growth in disposable income per capita . The event gathers experts and professionals in the area of Chinese rural development to discuss and share insights on rural revitalization strategies, policy interpretation, implementation and regional practices. The Festival also consists of a series of workshops and seminars including agricultural forums, agricultural technology roadshows and presentations of quality agricultural products. Tourism is also a highlight, with an introduction of village tourism routes, boutique hostels and photo exhibitions around the region. In addition, Xi'an districts and counties will organize shows including gong and drum performances as well as a singing contest, cooking competition for chefs, and peasant painting and paper-cutting exhibitions to demonstrate the current agricultural and cultural development in the region. Quality products in agriculture and tourism will be rewarded from a selection of agricultural products and boutique sightseeing tours. As part of the city's development initiative to accelerate rural area economic growth by supporting China's farming culture, the Festival is a new model of urban-rural integration which will help to build a modern village in Xi'an with prosperous agricultural industries, sustainable ecology and effective management systems before 2050. To address the "Three Rural Issues" in the region, capacity-building for farmers, revitalization for rural communities, and brand development for specialty crops, Xi'an has been working on regional poverty alleviation through agricultural reform. In 2018, Xi'an set up 496 farmer cooperatives and more than 400 agricultural parks. In addition, tourism has brought 26.5 million visitors to rural areas. Moving forward, Xi'an's rural areas are radiating unprecedented vitality by standing at a new level, digging and building a new rural culture. The Xi'an Farmers Festival was established in 2017 to shine a light on China's "Three Rural Issues" and establish Xi'an as a leader in rural and agricultural development.